Performing a salary comparison should be an annual activity for every business owner, or HR manager. Doing annual salary comparisons ensures that you are paying your employees fairly and in line with the going local market rate for their position. Not only is this the best practice from an HR standpoint, but it will also help prevent losing talent to competitors who are paying more. There are many salary comparison tools on the good old internet, however, we recommend the following 5 salary comparison tools as the best to use. As we’ll explain below, each tool is good for different kinds of jobs. It’s also important to backup your findings with at least 1 other source, to confirm the data is accurate. Indeed is our recommended job board because it is the largest, incredibly easy to use and cheap. The Indeed salary research tool is no different. It’s free and it’s built from data from both job postings and job seekers who use Indeed, which tallies into the tens of millions of people and postings. To use it, simply enter the name of your job role, and find the closest match. Indeed will show you the average salary, a chart of salary distribution and other data. Using the “Location” dropdown field at the top, you can also filter this data by state or city. LinkedIn is a gold mine of data, collected from the surveys it takes of its members, job postings and the surveys it takes of the employers that post their jobs on there. They made a super easy-to-use LinkedIn branded salary research tool. The LinkedIn salary tool has a wider range of roles compared to Indeed, so it is is especially useful for highly specialized roles, technical roles, or higher level roles like the Director level and above (which you may not find on Indeed). LinkedIn is also unique in that you can compare salary based on years of experience, which can be useful if you have a multi-generational workforce or a variance in years of experience amongst your team members. Glassdoor, like Indeed and LinkedIn, pulls its data from job postings and job seekers. While smaller than Indeed, Glassdoor still maintains good authority in the job marketplace and uses credible data. You can find their free salary tool here. Payscale provides a higher level of detail in their salary reports, including taking into account how many people the employee supervises and past work experiences. You can see a sample report here. However, Payscale is typically not free. While you do get one free salary report when you create an employer account, you will then need to pay for each report after that. You can also try to bypass this by pretending you are the employee himself; the salary estimator from the employee’s side is always free. The federal government’s Bureau of Labor & Statistics is the original salary comparison tool. They track what Americans make professionally by location and occupation, and all of the data is free. While not a great fit for newer roles, or tech-oriented jobs, there is a lot of good data here for the taking. Let’s now look further into how to do a salary comparison and what data points you’ll need. These are the two main factors in doing a salary comparison. While location is simple, job title can be a be more complicated than you think. Having accurate job titles for your team members can slip your radar as a small business owner, especially when employees have a wide range of job duties. Try our job title guide to help you figure out the proper title you should give your employees for a salary comparison. Sales Associate autocorrects to Retail Sales Associate. Average Annual Salary is $51,333. Sales Executive has an Average Annual Salary of $80,378. So, a job title can mean a $30K difference in pay. You will want to make sure the job titles you are giving your team accurately reflects their job duties in order to make sure your salary comparison is accurate. The number of years of experience a candidate has can be a huge factor in how much you should be compensating them. The issue of having a multi-generational workforce can complicate things these days, since candidates tend to change careers over time. You need to then assess how many years they have of related experience, versus how many years total work experience. Then, based on the number of years, determine how much extra salary the position should demand. For example, let’s take the position of Website Developer. Let’s use the LinkedIn Salary tool, which includes information on years of experience, to figure out what we should pay two different Web Developers in Chicago, IL. As you can see, we get a very large difference: Nearly $12,000. In this scenario, an experienced web developer employee will probably expect to be paid at least 20-25% more than their newbie coworkers. If you’ve noticed any trend of veteran employees leaving for other opportunities, you might want to scrutinize if they’re being paid enough, which we talk about below. However, before you give everyone a pay raise, let’s talk about education. Another major factor in determining salary is their education level. In lieu of experience, a business might hire someone with, say, an MBA because of the unique skill set or knowledge they bring to the table. However, degree level, or if a candidate has a degree at all, needs to be balanced with experience when considering compensation. So how do you decide what to pay that candidate, versus the candidate with a Master’s in Computer Science but only 2 years of web development experience in the workplace? Again, let’s check the LinkedIn Salary tool to figure out what Web Developers typically earn, based on their level of education. Above we see how much a Web Developer earns with varying education levels, and 1-5 years of experience. 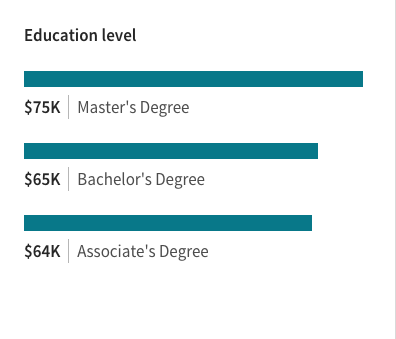 At the Master Degree level, the Web Developer earns a whopping $75K, despite having only a couple years experience. 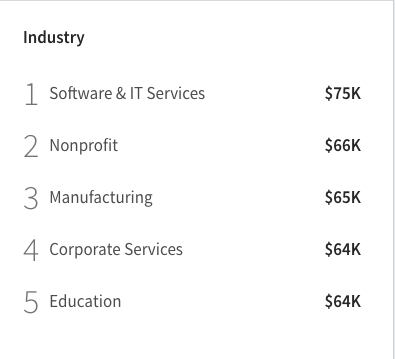 By comparison, the Web Developer with 15 years of experience but no degree earns only $64K per year or less, according to the LinkedIn Salary tool. In this Web Developer scenario, education seems to be a more important factor than experience. This won’t be true in every scenario, so it’s important to look this up for your specific job title, industry and location. LinkedIn is a good (and free) place to start, but you may also want to back up your findings with a report from Payscale or another data source. You will also want to think about 2 more factors, starting with your company size, which we talk about next. As a small business (or startup), you are typically not expected to pay as much as the Fortune 100. Common knowledge understands this since, since aside from not having the financial resources, working for a small business has other perks, which we talk about below in our Total Compensation section. Going back to our original two factors, your location is going to be very important in determining your compensation as a small business or startup (along with your size). For example, startups in San Francisco and Seattle offer “sweat equity” in their job offers including common shares or partial ownership of the company to attract top talent as a startup. However, this is not as common in Chicago or New York, and instead, startups in those cities need to simply be able to pay in alignment with market rate for the talent they want. A final major factor you will want to consider when doing a salary comparison is including what industry you are in. A Software-as-a-Service (SaaS) company versus a graphic design firm are going to command different salaries for a similar role, like a Salesperson or a Marketing Manager. This is when doing your research is imperative. 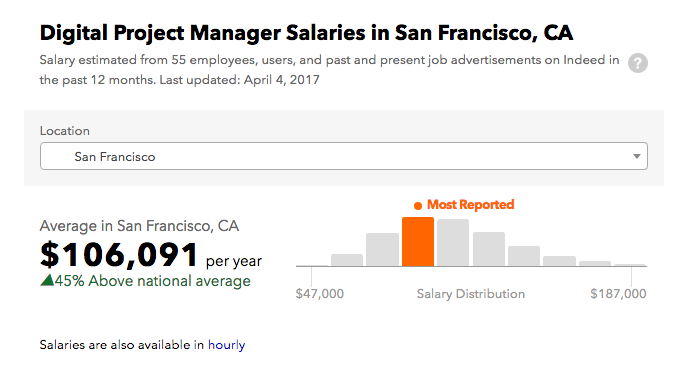 You will want to use Indeed’s salary research tool, as well as perhaps LinkedIn’s or Glassdoor’s to provide perspective. You also might consider looking for comparison data for companies in your similar industry and location using these same tools. Once you collect these main 6 factors for each job, you should be able to use one of the salary tools above to thoroughly get an idea of what your company should be paying its team members. A compa ratio takes into account several of these factors to help you figure out a salary range. Learn more about compa ratio. Doing a salary comparison, or a “compensation analysis” in fancy terms, is something that clients in my personal consulting business ask me to do frequently for their small business’s roles. Usually, it is for a potential hire, but sometimes it is for a current employee. Since it is my client, I already know how large their business is, and the industry they are in, which are the remaining 2 factors of the 6 factors we talked about above that I need to have to perform a salary comparison. For a lower level role like an hourly position or a position that, in general, will be $75,000 or less, I will use 2-3 of the salary comparison tools and my go-tos are Indeed Salary, Glassdoor, and Payscale. For a higher level role that is technical or generally above $75,000, or requires an advanced degree, I will use Indeed Salary, LinkedIn Salary Tool, and Payscale. Then, I create my client a report that shows where the data came from, the ranges and averages of compensation for their job title and location, and then I provide an analysis of the data in layman’s terms and a suggestion of what I think is an appropriate pay range for them as a company and for what I know they are looking for in a new hire, factoring the other things I know about the client, to create a total compensation picture, which we will talk about now. Try to put a number on what the benefits and other environmental and cultural factors might be worth to a candidate. For example, I know many people who, if given the chance to work from home, would take a serious pay cut of 10-20% since then they do not have to commute. As a small business or startup, you will want to consider how to articulate total compensation in your offers to potential new hires. However, please note that the salary comparison tools do NOT include total compensation; they are calculating salary alone in their data. Let’s now analyze what you found for your small business. Before you dive in and do the research, you might be wondering if you need to worry about compensation analysis in the first place. Here are 5 signs— 3 signs that you are paying too little and 2 signs that you are paying too much— that should give you motivation to do a salary comparison analysis for your team members. If you notice that you are losing employees faster than you can recruit them, or maybe you’ve noticed a mass exodus of your team members to your competitors, then you need to think about your compensation plan as it stands. If your employee turnover is over 20% (we show you how to calculate that in this article), you will want to understand if pay is part of the reason team members are leaving your company. Consider implementing exit interviews or an employee engagement survey that also addresses salaries. If your office door feels like a revolving door for conversations with frustrated employees (or from frustrated managers who are dealing with this on the ground), then you may need to do a salary comparison. While general unrest is not always related to pay, it certainly can be. As we recommended before, you may want to try an employee engagement survey that addresses compensation to get to the root of the unrest, as well as other constructs like office environment, management, and employee recognition. However, Harvard Business Review writes a piece counter-intuitive to this advice that points out how most people have NO IDEA what the going market rate is for their role. This can make salary research via our free salary comparison tools all the more powerful, since it will help you explain your compensation rationale to any frustrated employees, if necessary. Do you dread when a position opens up at your business because you “know it’s going to take forever to fill”? Is that because you are always looking for a diamond in the rough; the somehow-superstar who doesn’t know their value? If recruitment is a constant battle where you are always finding that candidates you want are too expensive, you need to either adjust your expectations, change the job title and duty of the role you are recruiting for, or you need to consider that you are underpaying for what you need. Now, let’s look at the other side of the coin (no pun intended). If you read that above paragraph and immediately thought of an employee or two, go back up to the top of this article and do your research. You need to be aware if you truly are paying the person too much, or if perhaps instead you are reflecting on a performance issue that they are having. While you are there, look up all of your positions with the free salary tools so that you have some data to start from. If you run a small business with an hourly staff and you constantly have referrals, walk ins, and other applicants out of the sky, it could be that your employees are bragging how much they make to their friends. Granted, it could just be that they GENUINELY love working for you, but it doesn’t hurt to check industry salary standards to be sure, especially if you are in a traditionally high turnover industry. Granted, the old adage of “you get what you pay for” holds true here. You may want to also do a little math: how much is it worth to pay more over constantly needing to recruit? It might be worth it to pay more than your competitor if it provides you time and cost savings in recruitment processes. So, how do we solve these difficult issues? Especially if we are paying too much? Now that you have done your research and figured out if you are paying too much, paying too little, or maybe your results varied across the board, you need to figure out what you want to do with this information. Here are 7 solutions on what to do next if you found discrepancies from what you should or shouldn’t be paying and the market rate. And remember, double check your research and use more than 1 of our tools above to get a better perspective. First, try not to stress too much about if there is room in the budget for paying more. We will go over a few options here that will not break your bank. Of course, if you can pay a little bit more, especially to the employees who deserve it, then do so. Also, consider implementing a performance management system and provide performance-based raises, as opposed to just automatic pay raises each year. Try something else that will motivate people to perform, like an employee recognition program or a commission opportunity for employees who are in roles that could be incentivized to sell. This is a double win- you get more performance and a growing business and they increase their pay! Implement a Paid Time Off (PTO) policy and paid holidays if you don’t already have one or the other. This is a real pay raise that has big value to employees. Try using fringe benefits, like an employee wellness program, commuter benefits, or something else that would have real value to employees over just cash. Consider doing a survey if you aren’t sure what would make the most sense for your team. But what about the other side? What if you are spending too much? This is a tough situation. Can you really downgrade someone’s pay? Is that even legal? The answer to both questions is yes (but you probably shouldn’t). So what can you do? You can implement a performance management system that rewards for achievement and documents performance issues so that you can easily fire someone or make a change in your team. You could change how the person gets compensation; for example, implementing a quota system or commission plan that allows them to be compensated at nearly the same level, but only if their performance backs it up. However, if you change your compensation plan, be aware that you may lost talented employees who get frustrated at this change. Chalk it up to a learning experience and knowing what you should be paying for the next time you recruit. Knowledge is power, and now you know to research salaries before providing an offer. Understanding your business’s compensation strategy and amounts versus your competitors and in your local marketplace is important for several reasons. You will want to balance your options on how much you spend with the talent you are spending the money on carefully and completely, as well as do your research on the marketplace around your small business. Protecting our client’s privacy is critical for us. We understand clearly that you and your company’s information are one of our most important assets. PayVision Online is a Dallas-based payroll management provider dedicated to making payday worry free for every client.